The Sustainability Studies Program @RooseveltU will host a Careers in Sustainability event on Wednesday, April 25th, from 4:30-6pm in WB 1315 and via Zoom. This interaction session features a panel of SUST alumni talking about their current jobs, career pathways since graduation, and the impact of their education on their job search and work experience. This special Earth Month event is open to all Roosevelt students, and SUST majors and alumni are particularly encouraged to attend. We’ll start at 4:30pm with light refreshments and informal socializing and networking. Then, at 5pm, our panelists will each speak briefly about their career tracks and current jobs, after which the audience can ask questions and engage panelists in discussion. Off-campus attendees can listen in and submit questions for the panel via Zoom videoconference (see login info below), which will be moderated by SUST adjunct professor Dr. Carla Jones. RSVP and questions may be sent to Prof. Mike Bryson (mbryson@roosevelt.edu). And please check out our other #RUEarthMonth2018 event coming up! Mon 4/16 — RU Housing Greencycle Event (4pm, WB 14th floor): As the Residence Hall move-out day approaches, many students may have clothing and other things that they don’t use or need anymore. Instead of throwing these things away and adding to landfill waste, students may donate those things to the RU Greencycle event, sponsored by the Residence Life project team of ACP/SUST 250 The Sustainable University. Drop-off bins will be installed for students to leave their donations on the WB 14th floor. You are not required to do any work or pay any fee. Students participating are encouraged to sift through donations and take clothing or objects for reuse. Any leftover objects will be donated to a shelter. Contact Claire Wilson (cwilson42@mail.roosevelt.edu) for more info. Wed 4/18 — Film Screening of Sustainable: A Documentary on the Local Food Movement in America: film + panel discussion, 4:30-6pm in WB 317. Contact Prof. Graham Pickren (gpickren@roosevelt.edu) for more info. Thurs 4/19 — Guerilla Gardening: Make Your Own Seed Bomb! (10am-2pm AUD Fainman Lounge), sponsored by the student organization RU Green. Students can come to our table setup to make their own “seed bombs” — a combination of clay, compost, and native seeds. They can be thrown into yards or neglected areas to transform them into flowering wonderlands. Contact Yessenia Balcazar (ybalcazar@mail.roosevelt.edu) for more info. Fri 4/20 — Undergraduate Science and Math Symposium (8:30am-4pm, WB 4th & 6th floors): RU’s annual showcase of student research in biology, chemistry, and math. Unbelievably fun as well as intellectually edifying! Free lunch with advance registration by 4/11. Sat/Sun 4/21 and 4/22 — Earth Day Events throughout Chicago, sponsored by the Chicago Conservation Corps (C3) and other organizations. Check out the many events listed here by C3 as well as these by the Cook County Forest Preserves. Mon 4/23 — SUST Student Symposium (WB 616 and 1315): Features ten team presentations by RU undergraduate students in ACP/SUST 250 The Sustainable University. From 2:00-4:45pm in WB 616, teams will describe their work on campus sustainability projects on bottled water policy, environmental communication, curriculum, purchasing, residence life, rooftop gardening, signage, transportation, and video production. Then at 5pm, we’ll head upstairs to WB 1315 for light refreshments and three individual presentations by senior SUST majors doing internships and independent study research this semester. RSVP to Prof. Mike Bryson (mbryson@roosevelt.edu). 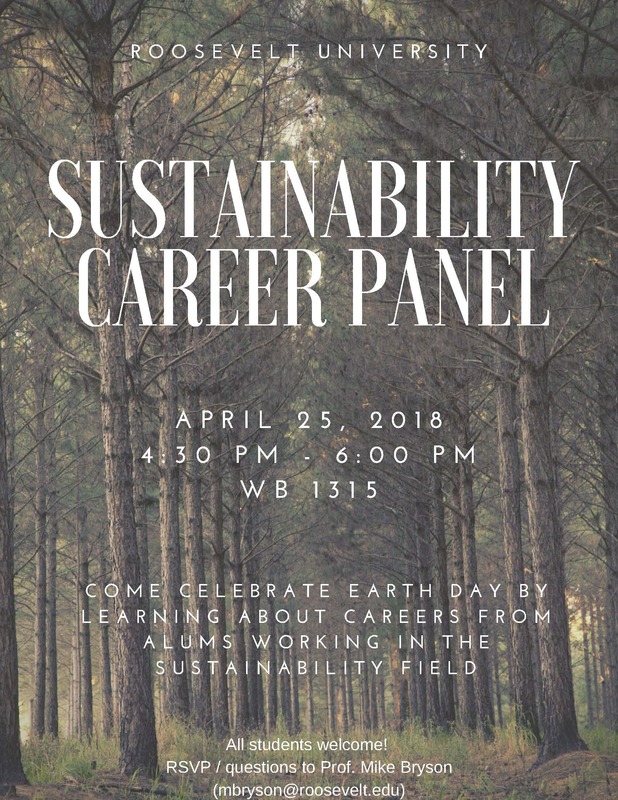 Wed 4/25 — Careers in Sustainability (4:30-6pm, WB 1315): current students from all majors are invited to this first-ever interactive event in which a panel of alumni from RU’s Sustainability Studies program will discuss their current jobs, career pathways, and the impact of their RU education, as well as answer questions from the audience. Light refreshments provided; RSVP to Prof. Mike Bryson (mbryson@roosevelt.edu). Thurs 4/26 — RU Green End-of-Year Meeting/Party (time/location TBA): Contact RU Green president Yessenia Balcazar (ybalcazar@mail.roosevelt.edu) for more info. This entry was posted in activities, alumni, education, events, faculty, food, humanities, presentations, Roosevelt, students. Bookmark the permalink.